Keynote Speaker Dr. Harold L. Paz, Aetna Inc.
View the education sessions and download handouts from classes. Click here to access your continuing education credits. Financial managers, industry experts and NAHC staff met in Hartford, Connecticut, for three days to examine challenges facing home care and hospice and explored solutions to common problems. The conference was a huge success, with informative and timely education sessions, solution-oriented exhibitors, delicious food, and ample networking opportunities. NAHC’s Vice President for Law Bill Dombi provided an in-depth analysis of regulatory and legislative issues including Medicaid, pre-claim review, and MedPAC. 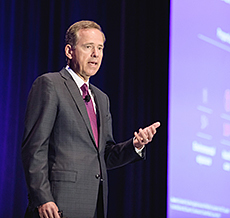 Aetna Inc.’s Chief Medical Officer Dr. Harold L. Paz presented a compelling case for the future of health care, which includes personalized care, an increase in concierge services, telehealth, and digital health solutions. Education sessions covered Medicare, physician practice management principles, alternative payment models, and many other hot topics. A common theme heard throughout the conference was “learn more about your staff;” by understanding their strengths and weaknesses you can make better business decisions. For more than twenty years, the National Association for Home Care & Hospice (NAHC) and its affiliate, the Home Care & Hospice Financial Managers Association (HHFMA), have provided financial managers with a deeper understanding of complex financial management techniques and proven business strategies. Save the date! Join us in Austin, Texas, July 15-17 2018, to stay on top of industry news and financial management trends. Interested in exhibiting? Download the Prospectus here.